Part 6 of the Guide to Asset Management is intended to support and assist the efficient collection, storage, analysis and reporting of pavement and other road-related infrastructure data. This will promote best practice asset management, including identifying critical assets and business risks. This section is relevant to contractors, data collection service providers, road agency research and innovation, policy development, benchmarking performance, and funding and inter-organisation communications at the local, state and national level. 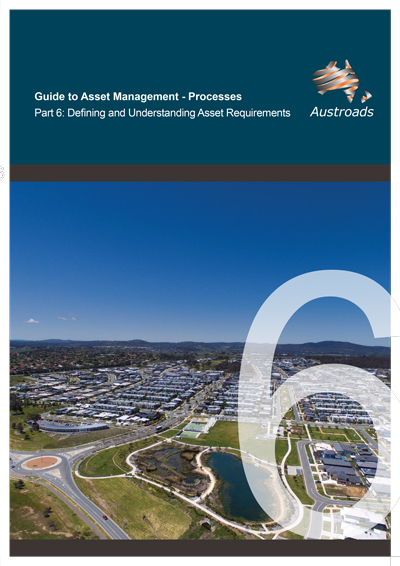 The third edition of the Austroads Guide to Asset Management has been produced to provide guidance to road agencies on the application of contemporary ‘whole of organisation’ asset management practice to road networks. The Guide consists of 15 Parts across three broad themes: management overview, asset management processes, and technical information. Asset Management Processes addresses business processes and enablers associated with the asset management business cycle. It also provides guidance on how to determine and plan to address stakeholder/community expectations, formulate and review asset strategies, develop works and investment programs, assess asset performance, undertake audits and asset valuations, and develop asset management improvement plans. This edition of the Guide to Asset Management (GAM) is based on the overarching asset management principles of the International Standard ISO 55000 which has a strong customer and strategic focus. Additions to the GAM include the impact of autonomous vehicles on the road and digital infrastructure, measures to reduce the environmental impact of asset management and the recently-developed practice of reliability centred maintenance. The GAM also documents the outcomes of Austroads-funded research undertaken since 2009, including asset condition monitoring equipment, asset performance prediction models and practices that account for risk. The GAM comprises 15 Parts with some 62 case studies demonstrating how asset management is practiced. 2.1 Why is Data Collected?